Our growing thirst for energy means today's projects dwarf most past endeavors. The Hoover Dam cost $49 million in 1936. Adjusted for inflation, that's only $825 million today. 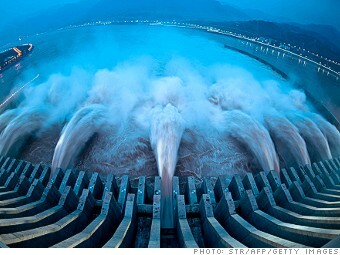 Estimates vary widely on its cost, but it's thought the Three Gorges Dam is the most expensive hydroelectric project ever built. The idea to dam the Yangtze river originated more than 70 years ago, but it wasn't until 1992 that the Chinese government approved the project. The dam generated controversy, partly because over 1 million people had to be relocated. Three Gorges has been coming online in stages, and only reached full power this summer. It can generate 84.7 billion kilowatts a year, enough to supply China with 10% of its electricity. Some say many of the projects on this list will carry a heavier environmental toll as more easily accessible energy is harder to find. Cost estimates for oil and gas projects are from the energy consultants Wood Mackenzie. They include possible future costs and other data which may not correspond to company esitmates.